The common redshank (Tringa totanus) belongs to the family of sandpipers and redshanks, the Scolopacidae. The common redshank is distributed in Europe, Asia, Mediterranean region, Africa, Middle East, Indian subcontinent, southeast Asia and Australia. These redshank species inhabit coastal and inland wetlands. These redshanks are polytypic species. The common redshank (Tringa totanus) is a small-sized redshank, measuring 27 to 30 cm in length and weighing 90 to 160 grams. The wingspan is 60 to 65 cm. Breeding common redshank species have head and upperparts colored grayish brown with blackish streaking. The rump is white. The hind edge of the wing is white. The tail is white with fine black bands. The underparts are whitish with brown streaks and spots. In flight the feet of the common redshank project beyond the tip of the tail. There are faint brown lores. The plumage of the non-breeder is paler with less distinctive streaks and spots. The chicks have mottled yellowish brown upperparts and white underparts. The bill is long, dark brown in color with orange base. The irises are blackish. There is white orbital skin. The legs and feet are bright reddish orange. The call of these redshank species is a repeated, loud, "chup..chup" or "tiu..tiu" sound. These common redshank species are distributed in Europe, Asia, Mediterranean region, Africa, Middle East, Indian subcontinent, southeast Asia and Australia. 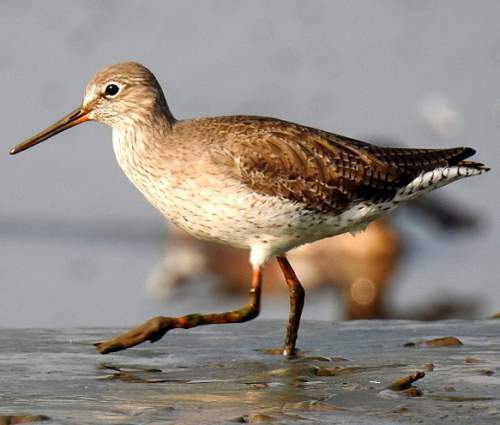 In India, the wintering common redshanks are distributed in most of the states, including Andaman and Nicobar Islands. They do not occur in arid regions of Rajasthan. They also do not occur in central India, spanning parts of Maharashtra, Madhya Pradesh, Chhattisgarh and Jharkhand. The Important Bird and Biodiversity Areas (IBA) of these common redshank species in Spain are, Cádiz bay, Isla Cristina and Ayamonte marshes and Prado lagoon, Ebro delta and Guadalquivir marshes. The IBA of these common redshanks in Saudi Arabia are Tarut Bay, Sabkhat al-Fasl lagoons and Jizan Bay. The IBA in Oman are Masirah island and Barr al Hikman. The IBA of redshanks in Egypt are, Lake Burullus and Lake Manzala. The IBA of the common redshank species in Finland are, Rahja archipelago, Käsivarsi fjelds, Pori archipelago and wetlands, Oulu region wetlands and Merenkurkku archipelago. The IBA in Poland is Upper Wisla River Valley. These common redshank species do not normally occur in forests. They normally occur in altitudes from 0 to 1000 meters. The artificial ecosystems and habitats of these species include flooded cultivated lands and flooded pasturelands. The natural ecosystems and habitats of these species include inland as well as marine wetland habitats like freshwater lakes, rivers, marine lakes, lagoons, intertidal mudflats, marshes and estuaries. The diet of this common redshank consists mainly of insects. Small insects, beetles, spiders and annelid worms are their primary food. They occasionally feed on small fish, tadpoles, molluscs and crustaceans. The breeding season of these common redshanks is from April to June in most of their breeding range. These birds are monogamous and territorial. The nesting sites include coastal saltmarshes, wet grasslands and swampy heathlands. The male redshanks make aerial courtship displays. The nest is a shallow scrape on a hummock or a clump of grass. The typical clutch contains four off-white eggs with brown specks and blotches. Both parents incubate the eggs. The chicks hatch out after 23 days and fledge after 24 days. These common redshank species are mostly migrant birds. The breeding populations in Europe and Asia depart the breeding grounds from June to October and migrate southwards for wintering. The return migration to the breeding grounds takes place between February and April. 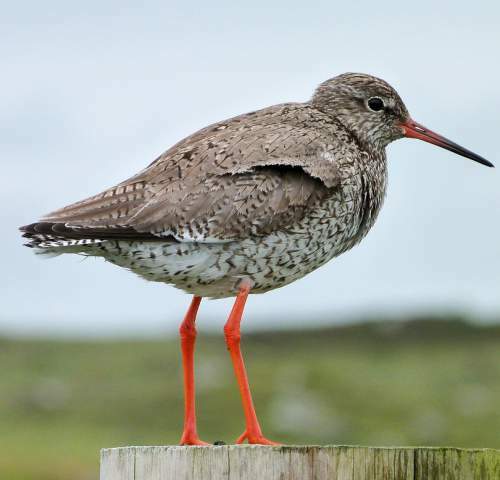 Non-migrant breeding resident populations of these redshanks occur in Ireland, United Kingdom, Belgium, Netherlands, Denmark, Portugal, Spain, France, Austria, Croatia, Italy, Albania, Greece, Bulgaria, Turkey and Tunisia. The global population size of the common redshank (Tringa totanus) is estimated to number about 1,000,000 to 3,500,000 individual birds. The overall population trend of the species is not known. In most of its range, this redshank species is reported to be uncommon to common. The generation length is 6.2 years. Its distribution size is about 40,700,000 sq.km. Habitat alteration and destruction, hunting for food and capture of adults and juveniles for pet-trade are the main threats that are endangering the survival of these redshank species. The common redshank (Tringa totanus) does not approach the thresholds for being Vulnerable, either under the range size criterion, or under the population trend criterion or under the population size criterion. The CITES (Convention on International Trade in Endangered Species of Wild Fauna and Flora) status is ‘Not Evaluated’ for the common redshank (Tringa totanus). The six recognized subspecies of the common redshank (Tringa totanus) are: T. t. totanus (Linnaeus, 1758), T. t. eurhina (Oberholser, 1900), T. t. robusta (Schiøler, 1919), T. t. craggi Hale, 1971, T. t. ussuriensis Buturlin, 1934 and T. t. terrignotae R. Meinertzhagen & A. C. Meinertzhagen, 1926. Current topic in Birds of India: Common redshank - Tringa totanus.